Uses of radioactive isotopes is a document which summarises what radioactive isotopes are used for. From smoke detectors to carbon dating, from monitoring thickness to sterilising strawberries and kidney mapping. There are lots of different uses and more are being worked out all the time in industry and medicine. Handle with long tongs or keep as far away from ionising radiation as possible. Imagine it like this. Little bullets are being fired in all directions. The further away you are, the less chance any of them will hit you. Just like using a sun lamp, radiation dosage and hence damage to body tissues increases the longer we are exposed to it. Keep it short. Radiographers taking X-rays wear lead aprons to absorb harmful radiation. When we store radioactive sources we keep them inside lead containers in a locked cupboard outside the lab. In Europe and the US, there are very strict rules for storage and safe transportation of radioactive material. Remember: alphas have a range of a single cell or less in the body. They won’t damage us if we don’t swallow the source. Low energy betas only travel a few tens of cm in air. Radioactive tracers emitting low energy betas won’t get out of the body cavity to a detector unless the organ they are taken up by is close to the surface. Higher energy betas and gamma emitters can be used to image deeper organs. 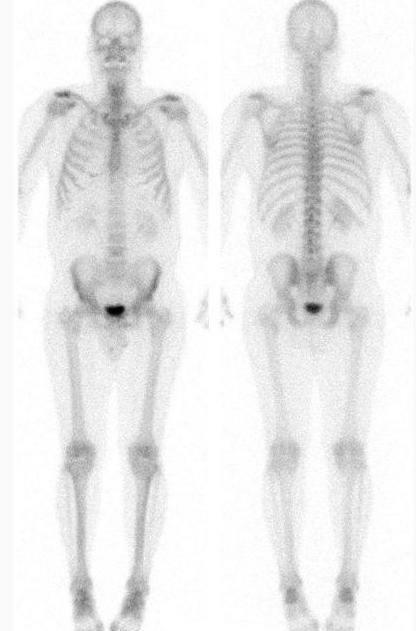 The first image is of a normal bone scan. The patient has been injected with technetium 99m – a gamma emitter with a half-life of 6 hours and scanned with a gamma camera – a special detector which detects gamma rays. Notice how the radiation has found its way to the bladder ready to be excreted. The lower image is of a bone scan from a patient suffering from cancer. 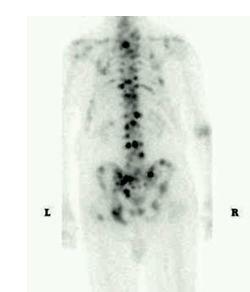 The radioisotope has collected in the cancerous tissue and appears as dark spots. Over half the background radiation that we receive comes from radon gas, a naturally occurring daughter product of Uranium decay. It is present in granite -some granite buildings have radon monitors installed; Cornwall in the UK is a prime location – giving people a scare some years ago. Concentration is higher indoors due to lack of ventilation and U based building products. Cosmic radiation sources are galactic cosmic rays, geomagnetically trapped particles and solar cosmic rays. 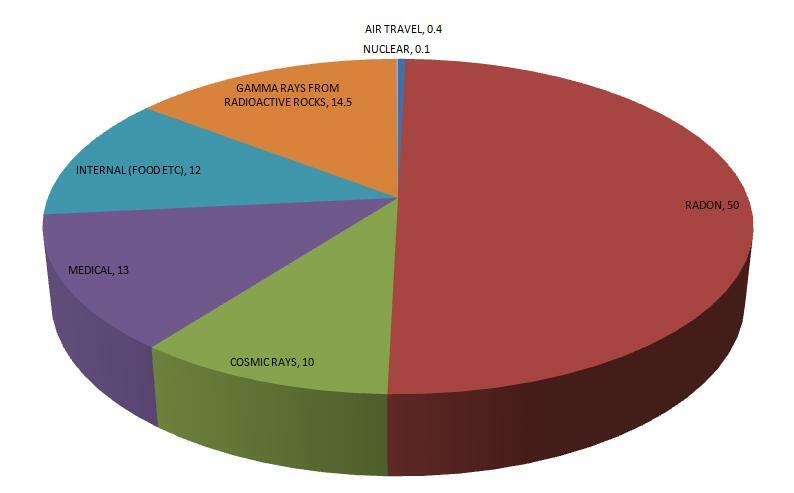 The amount of cosmic radiation varies with atmospheric thickness, i.e. altitude and latitude, so taking a plane ride increases our exposure to background radiation. On the ground, fortunately, the atmosphere provides an effective shield. The gamma and x-ray radiation from the soil is due to uranium and thorium decay chains and naturally occurring Potassium-40 and varies with geographical location. A man of mass 80kg probably has 160g of K in his body of which radioactive 40 K comprises 0.01% of the total so we ourselves contribute to our own background dose. Rich sources of potassium in our foods are ready to eat apricots and tomato puree – thus in baked beans also, so it really is true – eating baked beans irradiates you. Here’s the whole nine yards, but percentages vary geographically. The chart includes consumer products such as tobacco products which contain 210 Po, a compelling reason for giving up smoking, domestic water containing 226 Ra and 220 Rn, combustible fuels, ophthalmic glass containing thorium for rose tinting, luminous dials and signs containing 3 H and 147 Pm and smoke detectors containing 241 Am amongst many others. 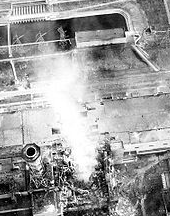 It’s worth pointing out that nuclear warfare, nuclear accidents and controlled detonations add very little to global body irradiation per person, although the Chernobyl disaster of 1986 released 1.4 EBq (exabecquerels) of radiation and caused significant local damage. Once, beta decay was thought to have violated energy conservation laws, since betas are emitted with a range of energies when, in a proton – rich environment, a neutron decays into a proton with the emission of a high speed electron and an antineutrino. It took a while to discover the antineutrino which soaked up the remaining energy. This is beta-minus decay. Beta + decay works in reverse. A proton changes into a neutron an antielectron and a neutrino. Energy is required and this only happens if the binding energy of the mother nucleus is greater than that of the daughter. The difference between them fuels the conversion plus the kinetic energy of emitted particles. Here are two examples, one of each. More properly, we should show charge conservation rather like this.. Both types are ultrarelativistic, in other words, the particles are emitted at close to the speed of light. Beta – decays occur above the N-Z line and beta + below it. After either alpha or beta decay, the nucleus is left in an excited state, frequently decaying itself to a ground state by gamma emission. I like to think of the nucleus ‘shrugging its shoulders’. 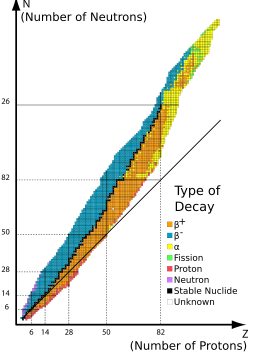 No change in nucleon or proton number, we can represent the decay by adding this. Alpha particles are helium nuclei emitted by quantum tunnelling usually from large unstable nuclei like U 238. Their short, thick ionisation tracks are shown in the cloud chamber picture above as tracks of mist. The 4/2 configuration or 2 protons and 2 neutrons is very stable – think how many multiples of it you can think of – carbon 12, oxygen 16 and so on, which are very common elements. Most of the Earth’s helium is the result of uranium or thorium decays in the Earth’s crust, finding its way to the surface as a by-product of natural gas production. Nucleon number goes down by 4, proton number by 2.This is effectively an explosive interaction so linear momentum is conserved, so much like a gun recoils when a bullet is fired, the remaining nucleus acquires momentum in the opposite direction to the alpha track. Alphas are heavy and slow-moving, causing massive ionisation of the air or other intervening medium, about 100,000 ion-pairs per mm path length. Their Relative Biological Effectiveness – a measure of cell damage on irradiation – due to this increased ionising capability is about twenty times more than betas of the same energy although their range is only a single cell wide. Each species emits with a characteristic energy. For example, bismuth 210 is an alpha emitter having a half life of just over 5 days and a characteristic energy of 4.69 MeV. Most alphas have energies of between 2.5 and 5.5MeV. They are deflected by electric fields being attracted to negative charges, also by magnetic fields, according to Fleming’s Left Hand Rule. They penetrate only a few cm in air, and are therefore stopped by thin paper, so alpha emitters are harmless unless swallowed. Their Relative Biological Effectiveness – a measure of cell damage on irradiation – due to this increased ionising capability – is about twenty times more than betas of the same energy. On a more sinister note, the 2006 radiation poisoning and murder of the Russian dissident Alexander Litvinenko was thought to be with plutonium 210, an alpha emitter. The picture is a representation of quantum tunnelling. 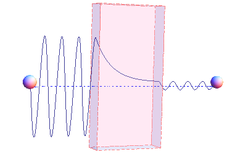 The wave is a probability wave of the alpha particle, its amplitude representing the probability of the event. Don’t worry about it for now….